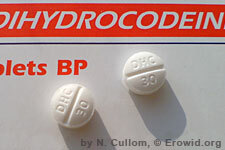 Dihydroxycodeine is an opiate agonist and analgesic used in the treatment of moderate to severe pain. It is often administered with anti-inflammatories (e.g. aspirin) and caffeine. Many dihydrocodeine preparations contain analgesics such as acetaminophen/paracetamol, which can be toxic to the liver in high doses.